So, you want the freshest hamburgers you can get. And you want to make sure you are serving a quality meat product to your family or guests. 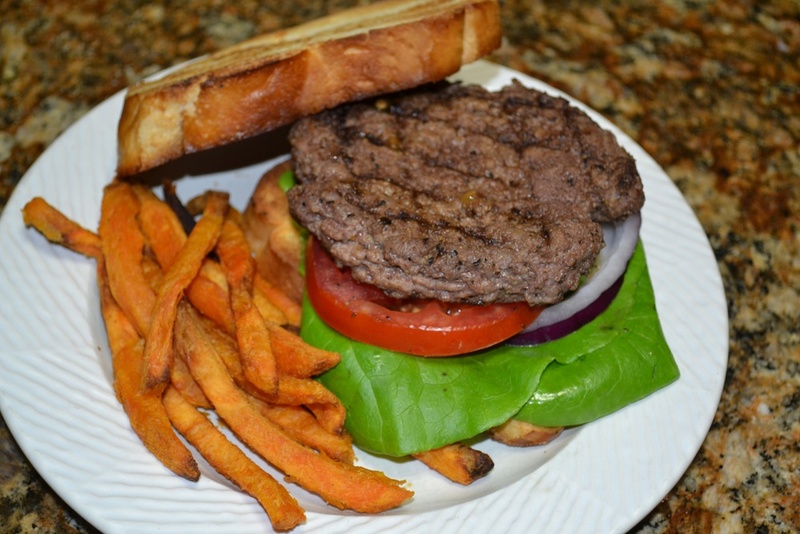 So here's how to make delicious and cost-effective hamburgers that everyone will enjoy. Our local grocery had a sale on chuck roasts, so we bought two nice size roasts that weighed about 3 pounds each. As you can see they are well marbled (specs of fat through out the muscle) roasts and would be great as roasts but not today. We are planning steaks and hamburgers. Yep, that’s right - steaks from a roast. The chuck roast comes from the front shoulder of the beef animal and is made up of many muscles. One of the muscles is the same muscle that makes up the rib eye steak. Most all of us love a good beef rib eye steak. Well this “chuck eye” is the same flavorful muscle except it is a little smaller and is still quite tender. As you can see in the picture below it doesn't take much to remove this chuck eye from the roast. We pull with our hands as there is a natural seam between this chuck eye and the other muscles of the roast. We do have to do some cutting and in just a few minutes we have removed the chuck eye. Our next step is to cut this chuck eye into two steaks. When I purchased our roasts I looked for ones that were at least two inches thick. This made our chuck eye two inches so that when we cut it in half we will have two steaks that are one inch thick. Perfect for the grill or the broiler. So once the chuck eye has been removed we turn it up as you see in the picture below which will allow us to slice it into two individual steaks. Now remember we had two roasts, thus two chuck eyes that made the 4 chuck eye steaks you see here. These will broil up nicely for Sunday dinner. We will just need a little minced garlic on them about two hours prior to cooking and then some salt and pepper. We want to enjoy that great beef flavor these have to offer so we hold back on the spices. Next we need to cut the rest of our roasts up into small enough pieces that they will fit into our Kitchen Aid grinder. As you see by our next picture we have our steaks cut, our meat chunked just right for our grinder and we removed a little bit of fat as we were cutting up our chunks. So now, let’s grind. We will grind the meat two times. This mixes the lean and fat better. Our first grind will be through our more coarse grinder plate, the one on the left. The one on the right is our fine grinder plate and we’ll use it for our second grind. The grinder knife, pictures in the middle will be used for both grinds. The secret to grinding is to make sure that you constantly keep meat moving through the grinder as both the knife and the plate are metal that are in contact with each other. And the grinder on the knife is going round and round on the grinder plate. Metal rubbing metal causes heat. So keep the meat moving to avoid this heat build up. As you see in our next picture there is a noticeable difference in our first grind and then the second. The one on the right has been ground two times. This product looks so lean that one might think it is ground round but we all know it is ground chuck. As I mentioned earlier, the steaks are for Sunday dinner but its Saturday night and that means it’s hamburger night. Fresh tastes best and this freshly ground chuck really has a very fresh beef flavor. We had ours with bacon we cured and smoked last weekend. It was delicious. Remember, we bought these roasts on sale. They cost us $18.88. We got 3 ¾ lb. ground chuck and 1 lb. 15 oz. of steaks. If we would have gone to the market and bought the steaks and the ground chuck (that looked like ground round) we would have spent $26.86. So we saved $7.98. And we had a lot of fun making a quality product for our family.